Is a mixture of sand /abrasive material forced with air against a surface ideal for steelwork, cars, pools, concrete, bluestone, timber and more. Shot blasting is a technique where small steel shot is propelled at speed onto the asphalt, concrete and steel surfaces, removing surface contaminants, dirt, grit and oil. We paint and apply polyurethane, epoxy and enamel to all Australian standards. We work close with our clients to provide protective coating solutions for every project. Non-slip is an additive added into epoxy and polyurethanes. Once applied and cured it creates a rough surface which prevents people from slipping over. No job is too big or too small for our experienced team - Call us today! Come and see us at Mobile Sandblasting & Protective Coatings and we will take care of all your blasting & painting needs. No job too big or too small! We also do full onsite blasting, painting, graffiti removal, floor grinding, pressure washing. 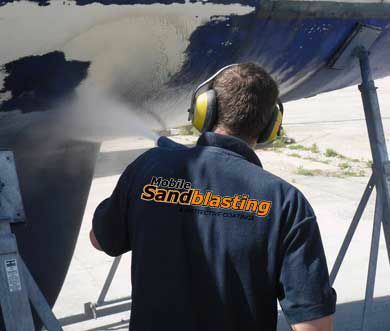 We cover all aspects of blasting including : Sandblasting, Beadblasting, Sodablasting, Waterblasting, Painting, Poly Urethane, Non Slip Coatings, & Floor Coatings, for all your Automotive, Building, Industrial & Domestic needs.